Shop Small and Buy Local isn’t just a Saturday in November, it’s a lifestyle. There is something about buying your groceries or items from a local store that turns a routine into a beloved activity. I love seeing friendly faces of my neighbors in a place where everybody knows your name. But what I love most is knowing who I am buying from and knowing I am putting money back into my community. Have you ever heard of Agritainment or agritourism? Agritainment is farm-based entertainment including activities such as hayrides, pony rides, wine tasting, cornfield-maze contests, and harvest festivals. Agritourism is a form of niche tourism that is considered a growth industry – it’s a way to bring tourism to a farm. Since agriculture is the largest industry in our county and in the State, both movements are flourishing here. 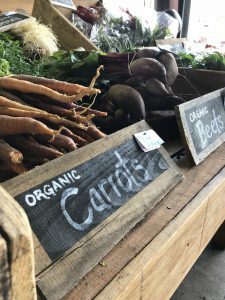 This brings us to Farm to Table or Farm to Fork – a movement of buying and serving local food directly from the source such as a farmers market, which is increasing agritourism in Lawrence County. 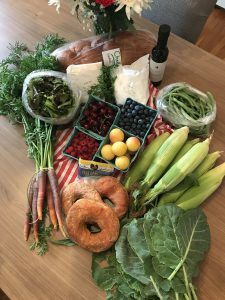 Over the past few years Dawson’s Orchards have been hosting farm to table dinner series in their apple orchards bringing in notable chef’s from Pittsburgh restaurants. This year Dawson’s will be accompanied with the Lawrence County Sprouting Table dinner series. 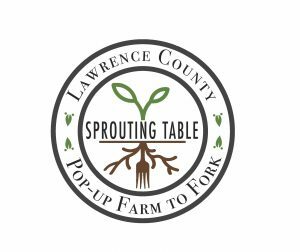 The Sprouting Table moves around to different locations throughout the county with dinner provided by Chef Sam Michael of Palate Restaurant. Interested in attending one? 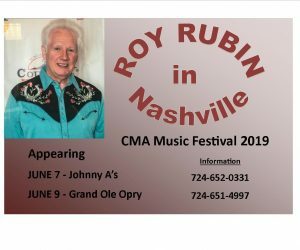 See below for dates. 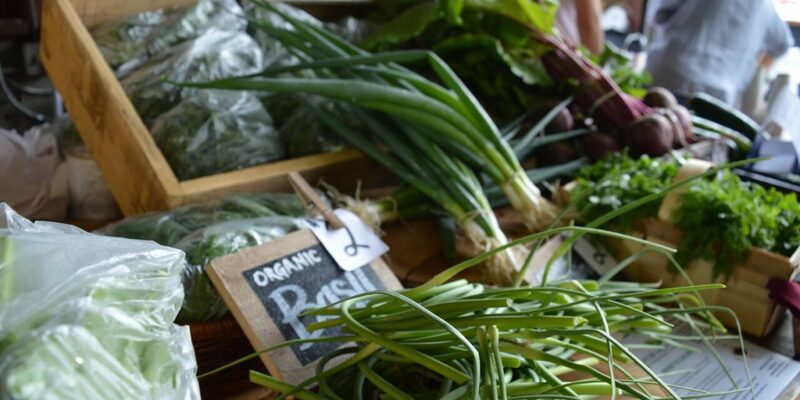 Farm to Table for me happens every day thanks to our local, dependable and reliable farmers. When last Saturday morning came I couldn’t wait to see what was in store. Fresh Marketplace was vibrant and full of life. The mural alone makes you smile. The band sounded fantastic, the food they were making smelled mouthwatering, the vendors inside had a little bit of everything, families were gathered around picnic tables eating the fresh produce or hanging inside by the arts and craft station. The vibe was amazing and you didn’t want to leave. Let me tell you about the egg fajita I had – I can’t because it was gone in a second – it was that good. It was unbelievably fresh and everything used was right there. Apart from the produce stands you could buy jewelry made by a local artisan, Print screen your own t-shirt, books from the Kiwanis club, fresh flower arrangements, hand soaps and more! 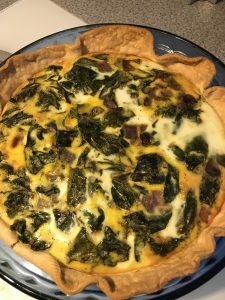 I eyed my purchases, compared to what I had in the fridge from previous trips to the market and decided on making a collard greens & cheese quiche with a side salad and grilled corn. Don’t worry dessert was not forgotten – we had mixed berries with a fig balsamic dressing over ice cream, Amish donuts and hot chocolate made from fair trade chocolate from Silk Road. Sounds delicious? It’s quite easy! See below for the recipe. 1. Preheat oven to 375°. Unroll pastry sheet into a 9-in. pie plate. Place the cubed Muenster cheese onto bottom of pastry-lined pie plate. 2.In a large skillet, heat garlic oil over medium-high heat. Add collard greens and onion; cook and stir 5-7 minutes or until onion is tender. Stir in salt and pepper to taste. Arrange greens over cheese. 3.In a large bowl, whisk eggs and milk until blended. Pour over top. For cheese lovers, Sprinkle top cheese. 4.Bake on lower oven rack 35-40 minutes or until a knife inserted in the center comes out clean. Let stand 10 minutes before cutting. 1.The key is to soak the corn in the husk for 10-15 minutes. While they are soaking, heat the grill. Remove from water and cut off top of the husk and bottom. 2.Keeping the corn in the husk, grill for about 2-3 minutes each side. 3.Remove and Serve with your favorite butter or flavored butter like herb and garlic or bacon and parmesan.